Flying insects use all sorts of creative methods to get from from point A to point B. About 54.5 million to 37 million years ago, at least one species of beetle was using wings that looked like helicopter propellers to get around, Science News reports. 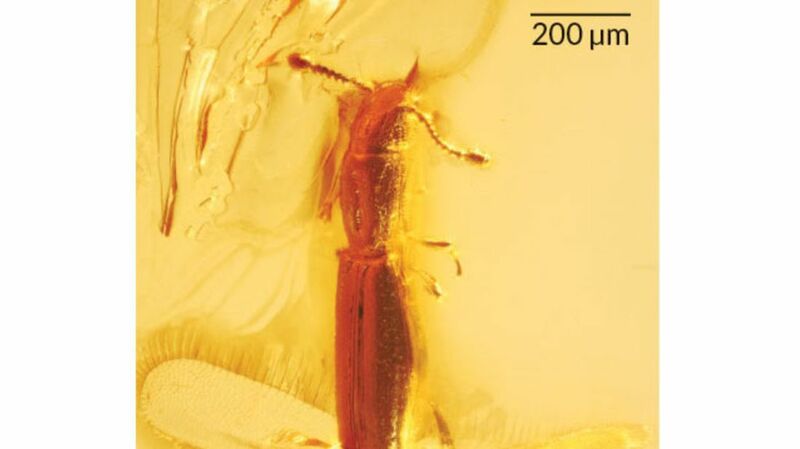 Two specimens of the beetle were found fossilized in amber by a German collector after being trapped there sometime during the middle Eocene epoch. According to a report published in the Journal of Paleontology, the beetles are members of a newly-discovered species dubbed Derolathrus groehni and are believed to be the ancient ancestors of modern-day Jacobson's beetles, a family of beetles. Researchers suspect the creature's feathery helicopter wings allowed it to soar great distances on the breeze. The fossils were discovered in Baltic amber, but the beetle's modern descendants have been found as far west as Alabama. Like Jacobson's beetles, D.groehni was puny—less than 200 micrometers wide. But what's perhaps the beetle's most distinctive feature is the pair of fringed, propeller-like wings sticking out from the bottom of its sleek, brown body.